Part I. Optical Biosensors: The Present. Optrode-based fiber optic biosensors (I. Biran, D.R. Walt). Evanescent wave fiber optic biosensors (C.A. Rowe Taitt, F.S. Ligler). Planar waveguides for fluorescence biosensors (K. Sapsford et al.). Flow immunosensor (A.W. Kusterbeck). Time resolved fluorescence (R. Thompson). Electrochemiluminescence (M.M. Richter). Surface plasmon resonance biosensors (J. Homola et al.). The resonant mirror optical biosensor (T. Kinning, P. Edwards). 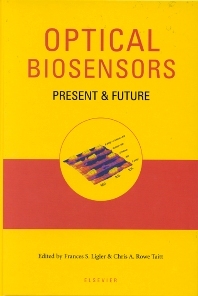 Interferometric biosensors (D.P. Campbell, C.J. McCloskey). Part II. Optical Biosensors: The Future. Genetic engineering of signaling molecules (A. Feltus, S. Daunert). Artificial receptors for chemosensors (T.W. Bell, N.M. Hext). Nucleic acids for reagentless biosensors (M. Rajendran, A.D. Ellington). New materials based on imprinted polymers and their application in optical sensors (S. Piletsky, A.P.F. Turner). Optically based sol-gel biosensor materials (J.L. Rickus et al.). Membrane-based biosensors (B. Cornell). Pebble nanosensors for real time intracellular chemical imaging (M. Brasuel et al.). Colloidal semiconductor quantum dot conjugates in biosensing (H. Mattousssi et al.). Soft lithography and microfluidics (R.S. Kane et al. ).